In Tokyo, sixteen-year-old Nao has decided there’s only one escape from her aching loneliness and her classmates’ bullying. But before she ends it all, Nao first plans to document the life of her great grandmother, a Buddhist nun who’s lived more than a century. A diary is Nao’s only solace—and will touch lives in ways she can scarcely imagine. Across the Pacific, we meet Ruth, a novelist living on a remote island who discovers a collection of artifacts washed ashore in a Hello Kitty lunchbox—possibly debris from the devastating 2011 tsunami. As the mystery of its contents unfolds, Ruth is pulled into the past, into Nao’s drama and her unknown fate, and forward into her own future.Full of Ozeki’s signature humor and deeply engaged with the relationship between writer and reader, past and present, fact and fiction, quantum physics, history, and myth, A Tale for the Time Being is a brilliantly inventive, beguiling story of our shared humanity and the search for home. 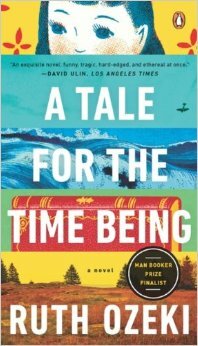 I just finished Ruth Ozeki's A Tale for the Time Being. I tried so hard to drag this one out...and I did. For weeks. I just didn't want to give it up. And when I was finally finished, I went into book depression! This is an amazing novel told in dual narration. I think there are some problems with the ending (just for me), but I would still give it five stars (and did on Goodreads), because it was a life-changing read for me. Be aware that there is some rough language and sexual situations in the book, but I felt it was always tastefully handled. These things don't bother me, but I know that they do bother some people. Lately, when it comes to reviews, I have seen lots of people issue "trigger warnings." I haven't decided if I am in favor of them or not, but, for the sake of argument, I would say there should be trigger warnings for: self harming; bullying; sexual assault of a minor/exploitation; suicide; abuse. You see? The thing about these trigger warnings is that someone might read them and then decide that I have listed way too many things that are negative and then not read the book. And if I had seen all of those, I might have done the same thing. But this book was so amazing--and, in case you are still on the fence, it all does turn out okay. The story is uplifting and fulfilling spiritually in a way I can't describe yet--I'm still too close to it. I actually picked up this book on the bargain table at Barnes & Noble! It is a Man Booker Prize Finalist, too! At first, I wasn't sure what to make of that...because sometimes I really love the Booker Prize novels, and sometimes I ask myself, "What were they smoking?" But in terms of style and interest, this was not a hard read at all. I couldn't wait to pick it up again each night, even though I limited myself to one chapter a day! Again: Wonderful read. Beautiful. I don't think you would regret it.